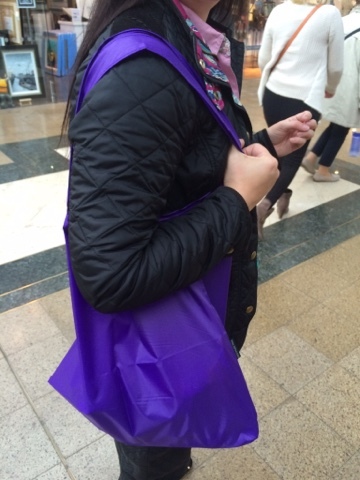 Did you know that from Monday 5 October 2015 there will be a mandatory charge of 5p per carrier bag charged to shoppers? This is in a bid to reduce the amount of waste caused by carrier bags. Enter the trolley dolly eco bag set. 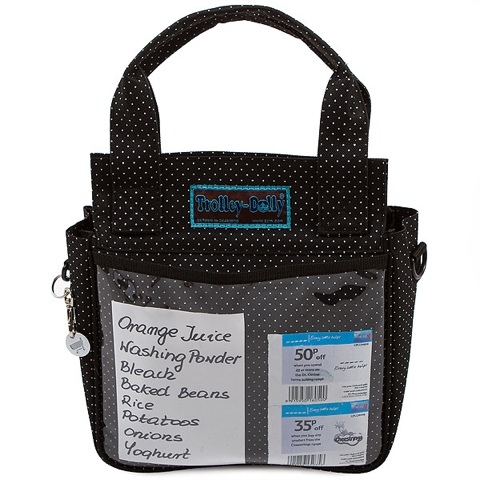 The trolley dolly bag holds everything you need for your weekly shop, consisting of 8 bags in total with an option to purchase additional bags or a 16 bag set, the trolley dolly has everything you may need. 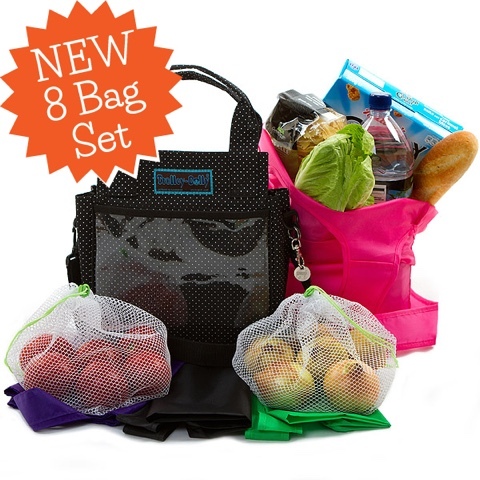 Included in the set are 3 durable 'vest' style bags, 2 larger box bags and 2 fruit & veg bags all contained within a very cute handbag style bag. I've had my trolley dolly bag for over a week now and I really can't praise it enough. I haven't yet done a full shop with it but I have been using it for odd trips to the shops and have been popping one of the best bags into my handbag each day. 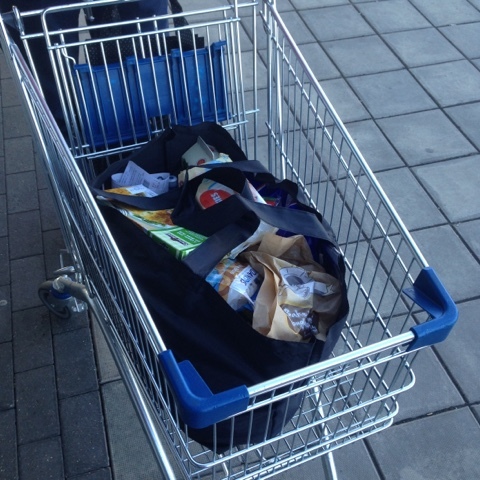 The box bag was perfect for a trip to lidl, and enabled me to put everything into the trolley without having to re-sort and pack before loading in the car. 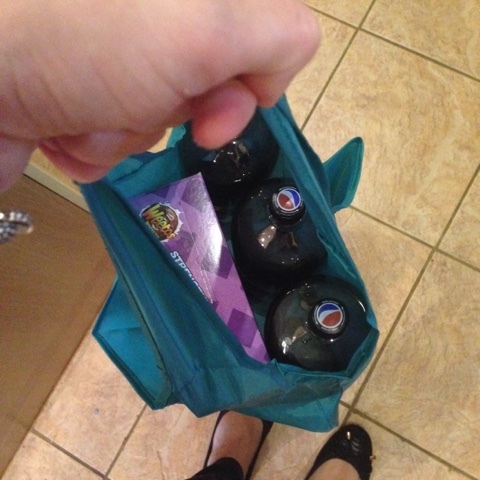 The vest bag is really durable, I've comfortably carried 3 bottles of pop in it with no difficulty. 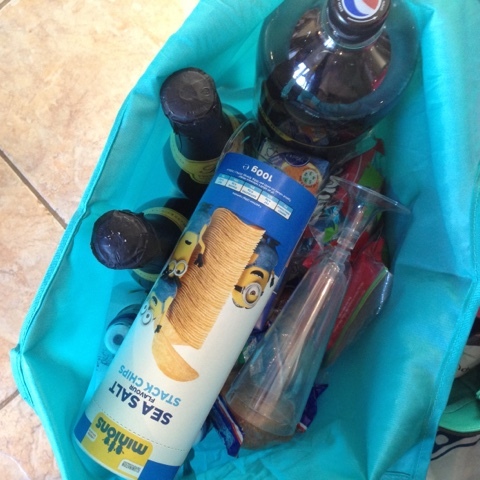 We even used one for our 'hotel necessities' for our recent trip away. 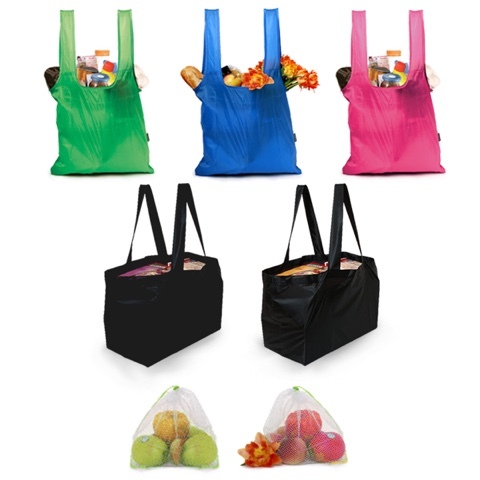 Although the long handles are really to enable you to tie up to prevent your shopping spilling they are also comfortable and make it easy to carry your bag on your shoulder. The trolley dolly bag itself very cute, features include a shoulder strap, a plastic pocket on the front for shopping list and coupons, a trolley token and an internal zip, great for popping your purse, car keys and phone in when you're shopping and of course contains all the other bags mentioned above. The trolley dolly is such a great, original idea and perfect for shopping trips in light of the new carrier bag charge! 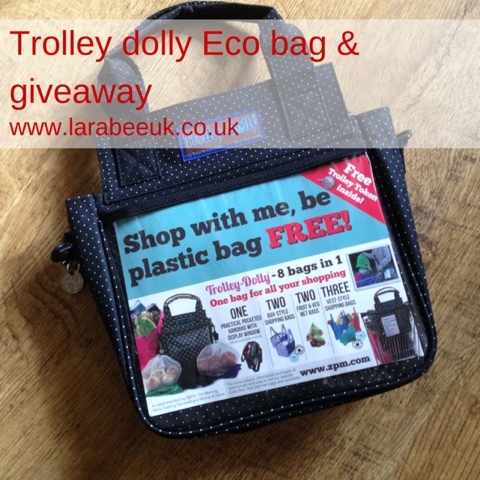 For a chance to win your own trolley dolly eco bag set worth £19.99 enter our giveaway below. Please be sure to answer the question in the comments and all other mandatory entry options for your entry to be valid. ZPM is from your initials - your name is Zoe Phayre-Mudge :-) Brilliant competition :-) Thank you ever so much. Zoe Phayre-Mudge. Cool name hehe! Zoe Phayre- Mudge. Thanks for the lovely giveaway.